A host of dignitaries including post leaders and elected officials attended the ribbon-cutting ceremony officially opening the U.S. Army Edgewood Chemical Biological Center’s (ECBC) Advanced Chemistry Laboratory (ACL) at Aberdeen Proving Ground South (Edgewood) Aug. 5. Maryland Senator Barbara Mikulski led the guests who spoke on the facility’s relevance due to current threats from rampant viruses and easy access to weapons of mass destruction. The ACL is designed to safely house ECBC researchers as they work with the most toxic compounds known to man. The facility enables ECBC scientists to conduct groundbreaking chemical research to protect the nation’s Warfighters from the perils of the battlefield, today and in the future. Suzanne Milchling, ECBC Director of Program Integration, hosted the event. Along with Mikulski, guests included Dale Ormond, director of the U.S. Army Research, Development and Engineering Command; Doug Bryce, Deputy Joint Program Executive Office for Chemical and Biological Defense (JPEOCBD); Col. Trey Jordan, Army Corps of Engineers Baltimore District; Heather Campbell from the staff of U.S. Senator Benjamin Cardin (Maryland) and Michael Baker from the staff of Maryland Congressman Charles “Dutch” Ruppersberger. Mikulski recalled the late 1990s and early 2000s when she and other lawmakers were concerned about the installation’s “dated facilities” as well as the disposal of the aging mustard gas stockpile. She said the project to provide a safe environment, not only for Soldiers and the surrounding community, but for the scientists searching for solutions, has spanned decades. Throughout, she said, ECBC scientists worked to come up with new techniques in the detection, handling and disposal of chemical and biological threats. “Those same techniques are now being used to dispose of Syria’s weapons of mass destruction,” she said. Ormond added that every day he observes personnel working on things that affect Soldiers and said the lab will make a greater difference in detecting, analyzing and developing protections against threat elements. “Clearly we know that ECBC is a critical part of our team,” he said. Highly instrumented and adaptable, the ACL has the inherent flexibility to address the ever-changing requirements of ECBC’s chemical defense mission. Safety of the workforce and the communities that surround the center is of the utmost consideration. The facility’s engineering controls, such as sophisticated ventilation and filtration systems, protect not only the scientists inside the lab, but the environment outside as well. Primary facilities within the ACL include advanced toxic agent laboratories, environmental chambers and secure work spaces for classified materials. Chemical agent operations in the ACL include analytical chemistry, Chemical Weapons Convention treaty support, filtration, decontamination and evaluation of chemical agent detectors. In addition to supporting ECBC’s Warfighter mission, the ACL allows ECBC to continue to serve federal agencies, including the homeland security and intelligence communities; the Federal Bureau of Investigation, the Department of Justice and the Department of State. Cost $62 million; one-third of the cost was for engineering controls, fume hoods and filters, which are paramount to providing safety. 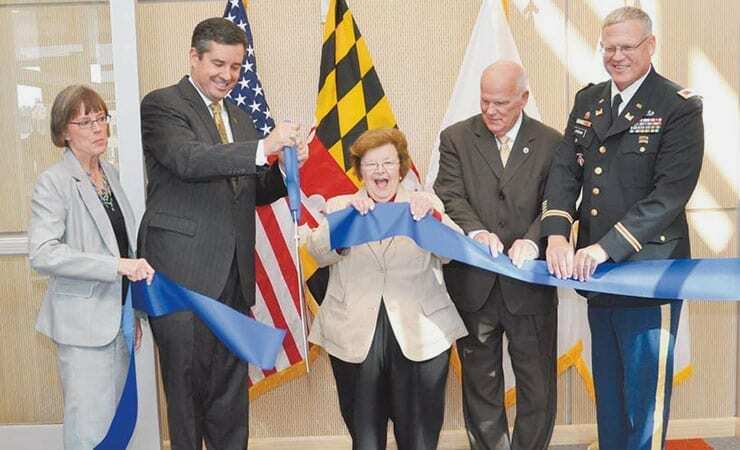 Image: Suzanne Milchling, ECBC Director of Program Integrations; Dale Ormond, Director of the U.S. Army Research, Development and Engineering Command; Maryland Senator Barbara Mikulski; Doug Bryce, Deputy Joint Program Executive Officer – Chemical and Biological Defense; and Col. Trey Jordan, U.S. Army Corps of Engineers, cut the ribbon officially opening the new Advanced Chemistry Laboratory at Aberdeen Proving Ground Edgewood Area on August 5.